… It’s Who. How often do we say this, bitterly, when others, less talented but with better connections, sweep away the prize that we believe to be rightfully ours? Well, just lately I’ve discovered it’s possible to put a much more positive spin on the old cliche. A couple of weeks ago, I decided I wanted a video trailer to promote my latest novel, Dead Woman Walking. (20 April in UK, 5 September in US) My tenth book, this is the story of a woman, the only survivor of a disaster, who witnesses something terrible and has to go on the run. Through the wilds of Northumbria, and the ancient city of York, she flees for her life, and we’re never quite sure whom she is most afraid of. Video trailers, or teasers, were all the rage a few years ago, and I have four fabulous ones that you can see on my YouTube channel here, but then they fell out of favour and publishers invested marketing spend elsewhere. The wheels turn, things come around, and with the phenomenal rise in the popularity of YouTube, book teaser videos are coming into fashion again. When my fifteen year old son gave my idea the seal of approval I knew I was onto something. The problem though, how to go it alone? Video trailers are very expensive, miniature movies with sound, lighting, photography, editing. There was no way I could hire a professional video production company and, in any event, all I really needed were a few atmospheric pictures, some eerie music, a still of the book cover. How hard could it be? ‘No,’ said Mr B, in that firm manner of his. ‘I do not have a week to spare learning how to use imovie.’ I looked at my son, a YouTube expert if ever there was one. ‘Homework,’ he said. I was going to have to think outside the box. So I did. The first step – writing the screenplay – was easy. I’m a writer. I know the story of Dead Woman Walking better than anyone. I’ve even done a short course on adapting my own work. But already my plans were moving on beyond a few artfully shot photographs. I could hear the voice of my tall handsome hero, Ajax (I know!) talking about how important it was to find the missing woman, Jessica. I could see Jessica, fleeing the countryside, hiding in barns, behind trees, cowering in the bathroom for the final climactic scene. I could see how it would work, but could I film all this on an iphone? And then I remembered John, whose wife is my son’s godmother, and who until very recently was a BBC producer, working on flagship programmes like Panorama. Recently turned freelance, John proved willing to help out a mate, but pointed out my script wasn’t sufficient. I needed a storyboard. I will never be rude about Media Studies A level again, because a few days later, we had our storyboard. In the meantime, I was casting. Nephew Sam will be perfect as Patrick the sinister gypsy. My friend Jill looks a lot like Jessica. Other friends seem surprisingly keen to be dead bodies in the opening scene – the disastrous aftermath of a hot air balloon crash. It was all going so well. Then we hit a snag. Music. Footage without music falls flat. The right soundtrack is crucial, but paying to use existing music is prohibitively expensive. I knew this already, because my previous trailers had had music specifically composed for them. Did I know any composers? Yes, I did. My dog-walking friend’s middle son, Will, is a talented musician and, I had a feeling, a budding composer. Might he be interested? He was, and we now have a creepy, menacing piece of music that will be perfect. From a sixteen year old boy! I was beginning to feel blessed. Mr B and I set out in the pouring rain one Sunday morning to find locations and discovered parts of the Chiltern Hills that, with a soft focus lens, will be virtually indistinguishable from Northumberland where Dead Woman Walking is set. 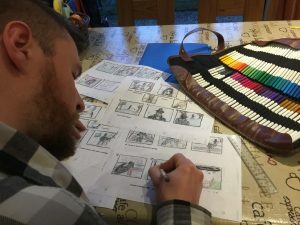 So, here we are, a brand new video production company with a director, a storyboard, a cast, locations, music, a balloon on standby and dates in the diary to do the shoot. Of course it could all go horribly wrong, and we could end up with something unusable, but I don’t think so. I am almost as excited about what we’re going to do together as I am about the book coming out. I think we’re going to create 90 seconds of fabulousness. Because, it’s not always what you know. It’s who you know. And I know some amazing, clever, wonderful people. Dead Woman Walking is out on 20 April in ebook and hardback. Pre-order here.